The condition of a streambank is an indicator of stream health, and streambank evaluations are frequent projects for Trutta. Streambank condition reflects the susceptibility of the streambank to the erosive forces of water (streambanks in good condition are less likely to erode and fall into the stream than ones in poor condition). The classification of Streambank Erosion Susceptibility considers streambank cover, height, slope, soil, and riparian condition and enables us to predict potential erosion at high flows. Using HDSS video to visually classify river bank conditions is both accurate (able to differentiate good and poor areas) and efficient (rapidly accomplish the task). 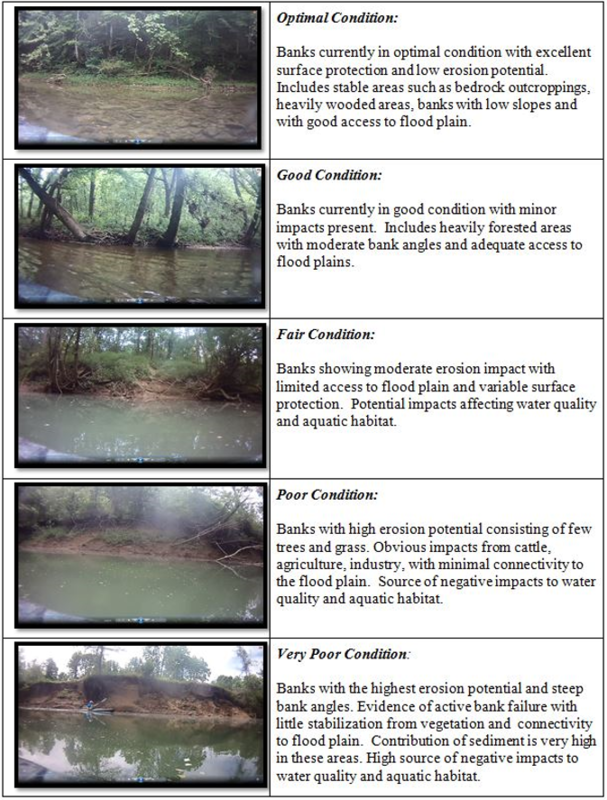 Research has shown that the video classification of streambank condition results in a similar classification as the much more time intensive Bank Erosion Susceptibility Index (BEHI). Trutta’s HDSS methodology ranks bank condition on a scale of 1 (best) to 5 (worst). An example of a Bank Stability Classification system. These images are from the HDSS Kayak System.